Neighborhood cats or even your own may enjoy sleeping or just lazing on your car. This is often true in cold weather when the hood is warm. Trying to keep them off can be a challenge. 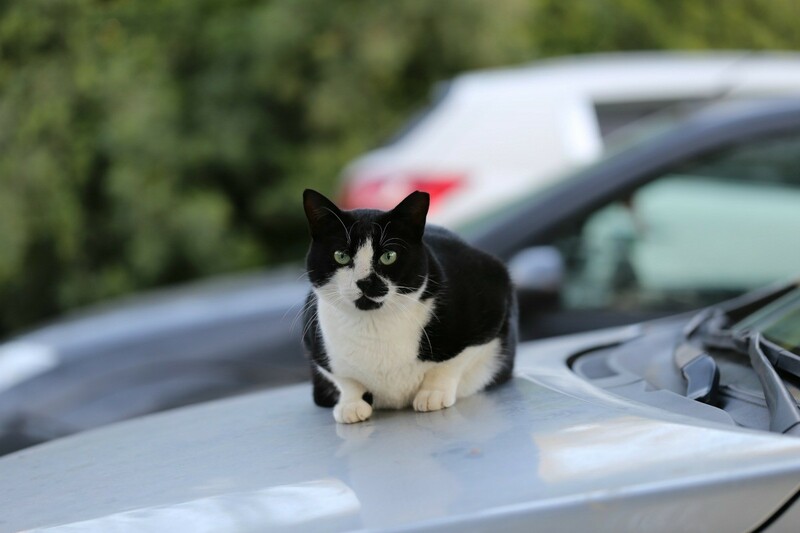 This is a guide about keeping cats off of cars. Does anyone have a solution for cats getting up on your car and leaving cat prints and scratches all over? Thanks! How about a car cover. If you don't wan't to purchase one, you can make one out of any waterproof material. An added bonus of using a cover would be preserving your car's finish. We used a water gun - after a while we just pointed it out the door and he would jump off. The only problem is it's a convertible and he still has his back claws. I am worried about him tearing the top everytime he jumps off. My cats used to lounge on my convertable top and I gave them the hose a few times and they never went up there again. I set up the sprinkler so whenever I saw them up there i turned it on. I still don't think they knew it was me. Also if you have your convertible in the garage or under a car canopy or car port. You can put 3 or 4 moth balls on the roof and trust me they won't go anywhere near it. Sprinkle Cayenne Pepper or other strong pepper on your vehicle. The cat will walk on it and then stop to lick its paws. When it does WOW. It doesn't hurt the animal but it will not take doing this too many times to teach the animal to stay away. My mom told me this and she and I have had to use this method many times and it really works. I am in need of information on how to keep cats off of cars. Cats do not like citrus, you can set orange peels around on your patio to keep the cats off. I have heard that this works. Also, cats also do not like bitter apple and I think another is spearmint. If desperate, cover the car in double sided tape, anything sticky. Cats do not like anything that sticks to their paws. Or better yet, put balloons on the car and when they jump up their claws will burst the balloon and scare them away. Couldn't resist to throw the last two in for laughs. Hope this helps and good luck I know it is frustrating having paw prints on your clean car!